I was heavy with fear when we can home on Wednesday. Hearing the word remission was a bit anticlimactic as we then heard what lies before us. As a mom, it’s hard to hear that April will be a hard month. I just want to fast forward time and tackle April right now. I can’t. It’s only November. That just bugs me. I’m in the business of problem solving, managing my family’s affairs, doing what I can today to make tomorrow better, and my hands are tied on this one. Right now, this childhood lesson applies to my thoughts of fear. Fear of the future, fear of Theo’s health, fear I won’t respond fast enough when something goes wrong. When I have a negative thought like that, I have to go back to the basics. Through prayer and scripture, I ask the Lord to give me some context and some relief. I know from reading my Bible that fear is not from God. 2 Timothy 1:7 says, “For God has not given us the spirit of fear; but of power, and of love, and of a sound mind.” I also know that fear is a waste of time and energy. Matthew 6:34 says, “Therefore do not worry about tomorrow, for tomorrow will worry about itself. Each day has enough trouble of its own.” Last, my mom’s verse in 2 Corinthians tells me to force my thoughts to obey Christ. If I am going to obey Christ, I first need to know what He is asking me to do. We are spending time this weekend reading over a summary of the 50 commands of Christ found in the first four books of the New Testament. The sarcastic side of me wants to say, “Jeez, by the time I even just read over this list, I will forget what I was afraid of in the first place.” But maybe that’s the point. Today Scott and I went to the KOP clinic for our next parent meeting. This was Scott’s first time visiting the clinic and meeting our KOP doctor. For the last month, he has been doing what daddies do, working to provide for us. There were a few days this month he wanted to take off, but we knew it would be better if he went to work. Daddies have a tough job and Scott is an awesome daddy. The last 30 days were called Induction. This was Phase 1 of the cancer treatment. We gave Theo steroids and antibiotics at home and he received chemo every Friday at the clinic. We went 2 -3 times a week to have his counts checked, never sure if he would need another blood transfusion. By the end of Induction, Theo has gained an uncomfortable amount of weight. He spends the entire day on the couch and has to be carried up the stairs. They kept telling us Induction would be hard, and now we better understand. For Theo, the results of Induction are perfect. According to a computer program, no cancer cells are visible in his blood, spinal fluid or bone sample. That’s when they use the word remission. However, they know for sure that Theo still has cancer cells hiding somewhere, they just can’t prove it. If he were to stop treatment now, the cancer would multiply and return in full force. Remission is a funny thing. I used to think that meant the cancer was over, that the person had won the battle. After our parent meeting today, I now understand that our battle has just begun. Phase 2 is called Consolidation. This phase is dedicated to protecting Theo’s brain. For boys more than girls, there is a strong link between leukemia and brain cancer. The best way to treat the brain is through the spinal fluid. Starting tomorrow Theo will have a spinal tap every Friday until Christmas. He will receive a dose of chemo directly into his spinal fluid to treat any hiding cancer cells around his brain. He has already received this medicine 3 times without incident, so it seems to me that it could be a quiet month. We could use a quiet month. Our doctor walked us through the plan for each month until June. If Theo stays the course, March and April will be his most difficult months. They will blast him with chemos he hasn’t had yet, wait for him to recover, and then blast him again. Theo’s aggressive treatment plan should be complete by August. 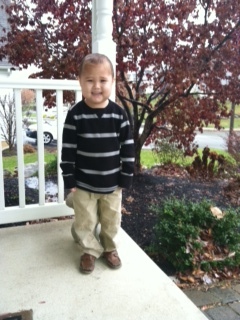 He will then begin a maintenance plan of chemotherapy in September, which will last until he’s 7 years old. These are the facts as I remember them, but my brain has yet to fully comprehend everything. So much of this will be unpredictable, so unique to Theo and how his body responds. It’s kinda scary for us to think ahead. I guess we’ll take it one day at a time, as they say. We signed the permission forms, and now we’re ready for Friday, Day 1 of Consolidation. Theo is now in remission. They studied a sample of blood, spinal fluid and bone, and no cancer cells were evident. They also completed a genetic study and he has no predisposition to cancer, so he remains an average risk patient. Remission is a loaded word, I’ll explain more another day. But by God’s mercy, Theo is now in remission. On the eve of Thanksgiving it seems more than appropriate to say thank you to all of you. My parents … My mom and dad are my greatest source of strength. They are my best friends, my role models, my spiritual advisors, my life coaches, my encouragers, my business partners, my right hand and my left hand. They are an extension of me, they fill in where I fade out. Their love knows no limits, and their love is action. Thank you Mom and Dad for all you do for all of us. Pop … Pop is married to Grandmom the rock star. Our oldest daughter attends a fine arts school two days a week. We carpool with another family, so on Mondays the kids and I are in the car for roughly 3 hours. When Theo was diagnosed, Pop took on our half of the carpool so that Theo wouldn’t have to bounce around in the car with us. Thanks, Pop. Our pediatrician … We are so thankful for our pediatrician. We have enjoyed his partnership for almost 12 years, and his role in this diagnosis was crucial. I had my first parent meeting at 2am at CHOP that first Friday morning. The oncologist greeted me by saying, “I heard about you hours ago, your pediatrician has told me all about your son.” We are grateful for such a dynamic advocate, a brilliant man who has the sweetest bedside manner, a man full of compassion for children and families. I hope he is reading this. Thank you. CHOP … The doctors and nurses and staff at CHOP are amazing. We have really enjoyed getting to know everyone and they have been a bright light to us in a dark time. Many of them we may never see again, but they played a significant role in our journey. Thank you. Our co-op … Our co-op is the sweetest group of friends. They are so fun to be with and they encourage us all in the Lord. Our kids attended co-op every Friday this month without Theo and me, and the moms worked together to watch over them. They have also watched our kids every time I have gone to CHOP, which has been a significant sacrifice of time and energy. Thank you, dear ones. 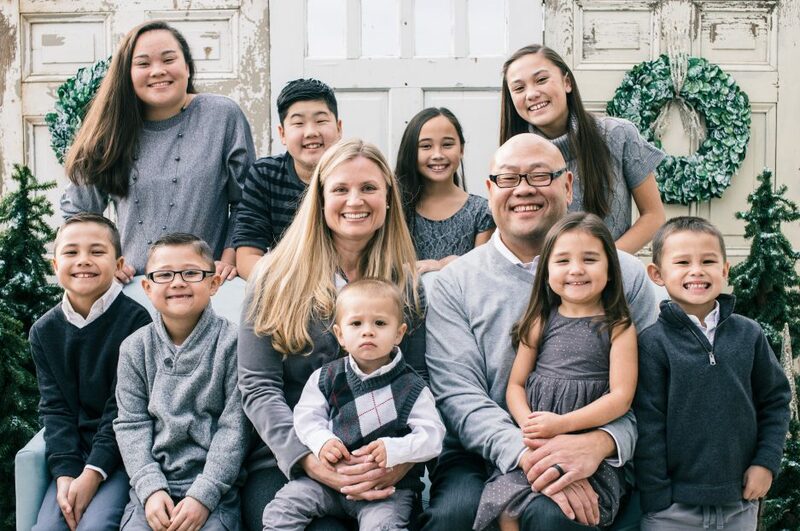 Our church … Our church has been a sweet extension of our family during this season. They brought us meals, checked in on us, prayed for us and even made gold ribbons in honor of Theo. Their spirit has been a source of joy and encouragement for us. Thanks guys. Thank you for the Wawa gift cards. I drive a 15 passenger van. Do you know how much it costs to fill my tank? Well, we don’t. We never fill my tank to full. My budget is $30 a week. This easily gets me to co-op on Fridays and church on Sundays. Only during soccer season do I blow the budget. Yet right now both our cars have a full tank of gas. The chickenpox day was a great example of how helpful this is. We had no idea I was on my way to the city during rush hour, but as I headed out we knew the tank was full. Thank you for the other gifts that have come in all varieties. With Theo’s diagnosis Scott now qualifies for FMLA. We are grateful that he has 60 days that he can take, at any time in any order, from now until June to be home with our family. The only problem is that he won’t get paid for those days. Any gift we have received has gone into a savings account. We can use that money along the way as we really have no idea what the future holds. Lastly, thank you for reading our blog and riding along with us on this journey. I was just thinking this morning this could be a very lonely time for a stay at home mom. Knowing that you all are reading as I write is a unique sense of community for me. As I stay at home and do what I need to do here, I am grateful for your time and your prayers. The day after Theo’s diagnosis he went into surgery to have a port inserted into his chest. It is like a pin cushion under his skin. When I leave the house, I put a numbing cream over the area. Once we get to the hospital, he shouldn’t feel anything (or so they say). They insert a butterfly needle that can draw blood and give medicines, and Theo’s little veins are never bothered. Once treatment is over, they remove the butterfly and he looks normal. It allows him to bathe and swim without risk of infection. It’s pretty cool. Theo and I have already driven to CHOP three times this week. Today is Friday and our last appointment for the week. I assure my faithful babysitting friends that this should be a quick and easy visit, as if I’m now some sort of cancer expert. The nurse inserts the butterfly needle but the port doesn’t work. She tries again. Theo is whimpering but hanging in there. It still won’t work. Something is blocking it. I almost faint. The nurse brings me OJ and a cold rag. I feel so embarrassed in front of Theo, this moment is not supposed to be about me. They treat him with a medicine and we wait. After an hour the nurse tries again. Nothing. She leaves the room to discuss with the doctor what to do next. She warns me that surgery might be a solution. Here’s the thing. It turns out my nurse is a Christian. She tells me that she wants to pray real quick before she tries the port again. She then tells me she’s in the process of adopting. Did I mention my husband Scott and our son Tai are both adopted? Even in the midst of this trouble, God is with me. He brings me a friend, a friend who prays, a friend who likes to talk about adoption, just like me. While the nurse is out of the room the port begins to work, as evidenced by the blood running through the line. I jump up and run to get her. We are both genuinely relieved. Theo and I spent a total of six hours in that room today. Not as quick and easy as I thought, but totally worth the experience. All day yesterday I was repeating this Bible verse in my head, “In this world you will have trouble,” John 16:33. I was also adding in this verse, “I am with you,” Isaiah 41:10. God warned us fair and square, we will have trouble here on Earth. He doesn’t promise us a perfect life. This is not a perfect world. It started out perfect, back in the Garden of Eden with Adam and Eve. God created mankind with a free will, the ability to make our own decisions. Both Adam and Eve chose wrong and sin entered the world. Subsequently, the rest of us have all sinned. Sin cannot enter God’s presence, He is perfect and holy. And the penalty for sin is death. God then sent His son Jesus to Earth as the ultimate sacrifice to save us from this penalty. If we choose to accept His forgiveness, we are then reconciled with God the Father now and for eternity. I have confessed my sins, I have received His forgiveness, I have trusted Jesus as my Savior, His Holy Spirit now resides in me, I now can walk in freedom while I am here on Earth, and I will go to be with Him when I die. I will never be separated from Him. But, I will have trouble. Like chickenpox on top of leukemia. Before we left the hospital Scott and I had to attend an education class on home care. I remember a few highlights off the top of my head, one being that the varicella virus was now especially dangerous for Theo. That shouldn’t be a problem we figured, because all of our kids have been vaccinated and 7 of them broke out with the real thing back in 2012. Cali started running a fever on Monday. With her molars breaking in I gave her Tylenol and put her to bed for the night. Wouldn’t you know it, Tuesday morning she wakes up covered in red spots. I call the pediatrician and ask if they would help me figure out what it is. Honestly, I think I already know. We visit the office that afternoon after lunch. Even the nurse practitioner admits she thinks I am letting the education class get to me. Nope. Chicken Pox. And Cali’s vaccination chart? She was due to get the shot last month, and we never came in. My bad. Scott left work early because the CHOP doctors didn’t want Theo and Cali in the same car. We put Theo in Scott’s car and I took the kids home. I grabbed my overnight bag while Scott and Theo waited outside. Theo and I headed to CHOP to be given a dose of antibodies. It doesn’t really matter that Theo was vaccinated at one, nor does it matter than he had the real thing at two. Chemo changes everything. Theo has little of his antibodies left, and he can’t make new antibodies, so they will give him someone else’s antibodies. Amazing. At first we were told we would be admitted indefinitely. Then the CDC weighed in and they decided to send us home. Cali was contagious days before, so the damage was done. We would also be an exposure threat to the other patients. Theo and I came home late that night and I went to town with the Clorox wipes. They are hopeful that the antibodies will last around 4 weeks giving Theo the immunity he needs while Cali gets better. We ask for your prayers as the virus subsides. Please pray Theo doesn’t get it, and please also pray Cali heals quickly.